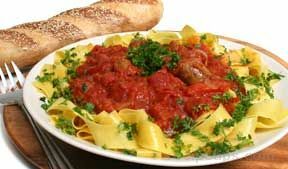 A zesty Italian dinner in a dish! In a large pot, bring 3 quarts water and 2 tablespoons salt to a boil. While water heats, prepare greens: remove any large stems, rinse leaves and chop coarsely. Slice garlic and cut the pepper into narrow strips. Cut sausage into 1" lengths, (casing on or off, as preferred). Over medium heat, brown the sausage in a heavy skillet, stirring occasionally. 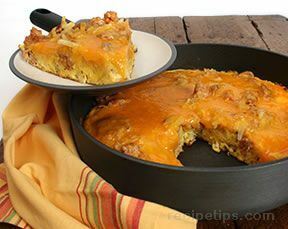 If, after browning, there is more than about a tablespoon of fat in the skillet, spoon some out. If there is little or no fat, add about a tablespoon of olive oil. 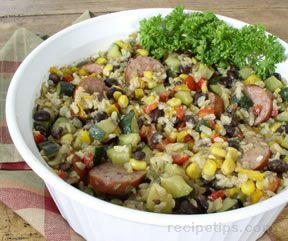 Add garlic and pepper to the skillet, stir into the sausage, and cook about 5 minutes. When the water boils, add pasta and cook according to package directions. About 5 minutes before pasta is done, add the chopped greens and submerge in the pasta water. Finish cooking the pasta and greens and drain thoroughly. 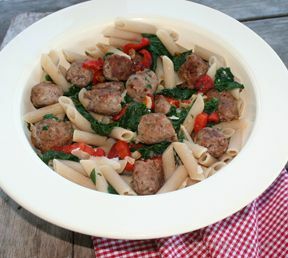 Put pasta in a serving dish, add sausage mixture and stir together. Pour olive oil over and serve immediately, with grated cheese on the side. (Sprinkle a little of the cheese on the top if you wish).